Hello. I am submitting this photo for the monthly contest. It is a picture of my three long coat German shepherds. Magnum is 2, Bella is a year and a half and Abby is 4 months in this pic. They are all smart, loyal and beautiful. They complete our family and I feel truly blessed to have them. What a great looking crew you have there. I know you are so proud of them! 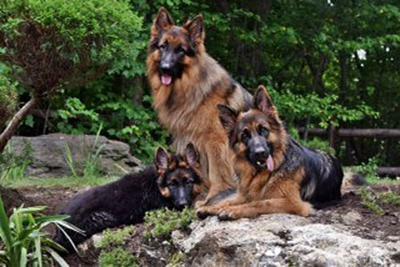 German Shepherds make wonderful pets and companions and if you have the opportunity to have more than one, they can be great companions and even great teachers helping tutor the new dogs as to what is acceptable and what is not in many cases. More than once, I have had my older German Shepherds teach the puppies or new additions to the family the way we do things and what not to do. So they are often great tutors if you have taken the time to teach them initially. These are super smart dogs and not for everybody. But if you have the time, patience and love for them, which obviously you do, then they can be like potato chips - you can never have just one. Continued success with your German Shepherd Dogs, Magnum, Bella and Abby. They are truly lucky dogs to have you as a mom! What a Beautiful Shepherd family!!! You have the Best protection there!!! German Shepherds are an Amazing breed as you know. Take care of your Shepherds and they will take care of you!! !